In earlier times, there was at least one 'geko' (ceremonial house) in every Sepik village. Today, clans that come from a common ancestor still construct a 'geko' together. The 'geko' contains ritual objects, including sacred flutes and masks, and is a meeting place only for men. Carved from hardwood, this house post supported the floor in a 'geko'. 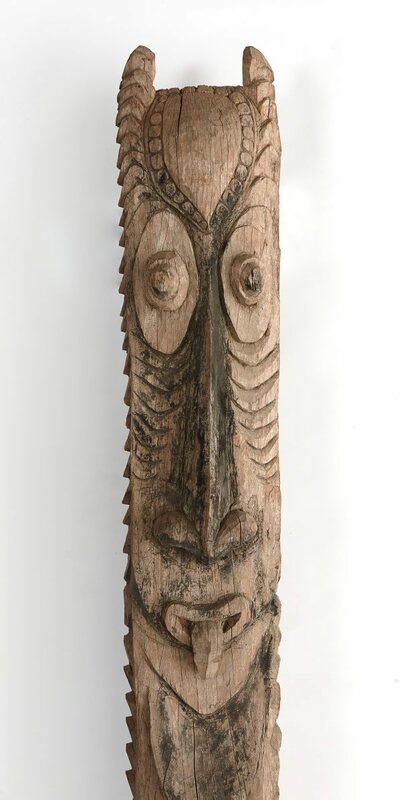 The upper carving is from the owl totem clan and is described by artist Toby Wanaki of Tegowi village as the 'japmara mundama', or owl face, with the small ears of an owl clearly visible. When a new 'geko' is built, all the house posts are painted black, red or yellow, to celebrate the naming of the 'geko'. Remnants of black pigment are still visible on this 'jambukrikwaru'.